DRDO through RAC is inviting all Indian candidates for these Government jobs for Scientist posts. All Indian Graduate Engineer including the students who are currently appearing in their final year of examination can apply for this DRDO Recruitment through the RAC website https://rac.gov.in . 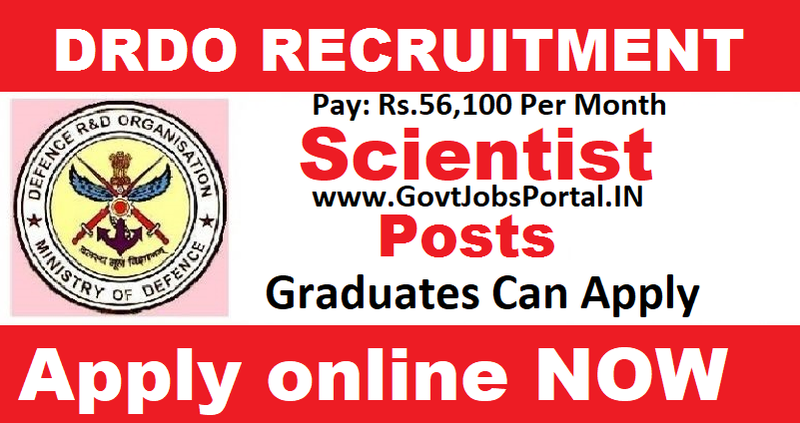 Government jobs for Scientist `B’ in DRDO in the pay Level‐10 (7th CPC) of the Pay Matrix (Rs. 56,100/‐) in specified disciplines and categories. You also visit to the official website of DRDO for more detail related to the pay scale an all other things. The link of DRDO website is “ https://drdo.gov.in”. DRDO (Defence Research and Development Organisation), India’s is a premier Defence R&D organization under Defence ministry of India. Those who are looking to make a career in DRDO as a scientist can apply for this DRDO Recruitment 2018. More information about these Government jobs is given below in this article, read the whole article carefully before applying online. Pay Band: Level 10 of CPC Pay Matrix starting at ₹ 56100. What are the eligibility criteria for applying these DRDO Vacancies? Education: At least First Class Bachelor’s Degree in Engineering or Technology in Mechanical Engineering from a recognized university or equivalent. Age Bond: Age of the applicants must be less then 28 years for applying these Government jobs in DRDO Department. What Application Fee I have to pay for Applying? Those who are belonging to the unreserved category have to pay ₹ 100/- as there application fee. (No fee for SC/ST/PWD/Women candidates). Candidates can pay the application fee through online mode. I am Eligible, Now how can apply for this DRDO Recruitment process? Those who are eligible for applying these Government jobs can follow the official website of DRDO for online application. We also share the online application link below under IMPORTANT LINK section. 6TH July 2018 is the Last Date to apply.